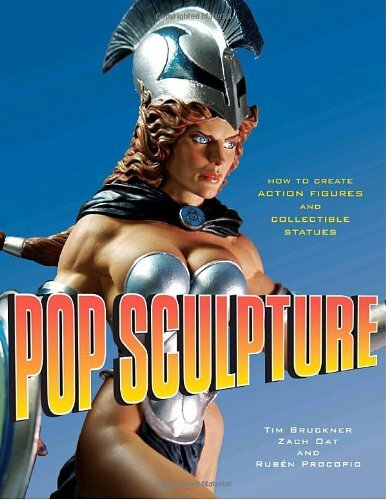 Here's a great book for anyone interested in sculpt figures, whether you're a collector, aspiring sculptor or a professional. The authors are Tim Bruckner, Zach Oat and Ruben Procopio. Both Tim Bruckner and Ruben Procopio have years of sculpting experience and have worked for companies like DC, Disney, etc. The book is written in an entertaining lighthearted manner, filled with sculpting techniques, photos and even comic-style drawings for illustration purposes. I like the one that advises you to always get your children's permission before melting down their crayons. That's one good advice you might overlook, and there are plenty more useful ones throughout. It covers from the conceptualization stage right to the finished sculpt and photography. As a non-sculptor, I learned a lot of new information about sculpting. There are different types of clay and each has different properties. A few sculptors were interviewed and they explain their preference. There's even a recipe if you want to make your own. They also show you how to create the armature (the wire support), how to cast, paint, make accessories and even create joints for movable parts. There are a lot of processes behind the scenes not obvious to beginners or collectors. The book covers them in great detail. Chapter 10 on painting is a fun read with cute cartoons of professional prototype painter Kat Sapene dishing out advice. It's a helpful book for any sculptors looking to make their first figure, more so for those who are looking to sell them as the book covers casting and a section on going pro. There are even tips on dealing with art directors and project managers. The book features mainly character models so you'll need to be knowledgeable about anatomy to get your sculpts looking good. I saw that book and plan on getting it. I want to try my hand at sculpting in my spare time since I'm pretty good with my hands and it's in my genes. Cool. Remember to post photos online.